Maria Kadoglou from YLNM member group Hellenic Mining Watch describes how, thanks to the EU’s mining-friendly policies, Greece and other European nations are becoming extractivist states, putting citizens, ecosystems and life-sustaining economies under threat. Published by Hellenic Mining Watch and Gresea Echos No 92, December 2017, Relance minière en Europe (french). Download pdf here. Since the 1970s, Greece’s mineral wealth was put forward by the country in order to secure accession in the European Community. Today, after many years of austerity policies, Greece, like the countries of the South before it, is experiencing the resources curse. Leonine contracts, an extractivist model geared towards exportation, the mineral resources of the country benefit the global economy, but not the Greeks. It seemed to be a perfect match. But early attempts by multinational companies, in the 1990s and 2000s, to exploit Greece’s much coveted precious metals ores in the country’s north were failing, one after the other. Obstacles included national and EU environmental legislation and, most importantly, community resistance. Local communities in Halkidiki and Thrace, having educated themselves on the impacts of large scale mining, realized that the proposed projects were a direct threat to their environment and livelihoods and staunchly resisted. These projects were finally annulled by the Greek Council of State and it was several years before the international mining capital launched a second attack. Enters the financial crisis. In 2010 Greece accepted a huge “rescue” loan, the first in a series of three until now, aimed at ensuring the country’s ability to repay previous loans and thus rescuingEuropean banks that were exposed to Greek debt. The Troika of creditors (EC–ECB–IMF) imposed a series of harsh austerity measures that have plunged Greece deep into recession, as well as structural reforms and extensive privatizations of state property and mineral resources. Roughly around the same time, the European Commission had started to develop the EU‘s new raw materials and industrial policies. The Raw Materials Initiative, launched in 2008 and consolidated in 2011, aims at ensuring the sustainable supply of raw materials to the European economy. Reinforced by the European Innovation Partnership on Raw Materials, it is intended to help EU achieve the ambitious goal of raising industry’s contribution to the EU’s GDP to around 20% by 2020 and boost EU’s competitiveness in the age of globalization. The second pillar of the RMI is to secure the supply of primary mineral raw materials from European sources. European industry is higly dependent on ores and metals imports and for several metals, such as rare earths and platinum group metals, the industry completely relies on imports. Thus the aim of the second pillar is to promote new mining within the EU, particularly of metallic ores, including seabed mining. 3) put in place a permitting framework that facilitates the exploration and exploitation of minerals. Greece was eager to comply and in 2012 was one of the first EU countries to adopt a National Minerals Policy3 directly linked to the Raw Materials Initiative. The National Policy outlines the main policy axes for the exploitation of mineral resources that will have to be horizontally integrated into all individual policies and plans. The focus is clearly to remove all obstacles that impede mining. Existing mining legislation (the 1973 Mining Code) already gives exclusive, outrageous rights to mining investors, including the right to expropriate private property. The According to the National Policy, legislative changes will have to be made in order to attract mining investment, that will speed up environmental and technical permitting and allow mining even inside protected areas. A draft law on the permitting of mining activities was presented in July 2017. The National Policy puts special emphasis on the development of “adequate” land-use plans that will ensure unrestricted access to mineral deposits while resolving conflicts with different land uses. Mining is top priority and takes precedence over all other potential land uses, including the protection of ecosystems. Provision will be made to change of land use designation of an area in case new mineral deposits are discovered. When put into law, these land-use plans will consolidate mining’s position as the dominant economic activity in large parts of northern Greece and any conflicts will automatically be resolved in favor of the one, single, dominant activity, mining. Another policy axis of the Minerals Policy is the “Promotion of dialogue – Acceptance by the local society”. Social approval is an important factor for the development of mining activity, but it is not a prerequisite. Local communities must be persuaded on the benefits and environmental benignness of the proposed mining operations. 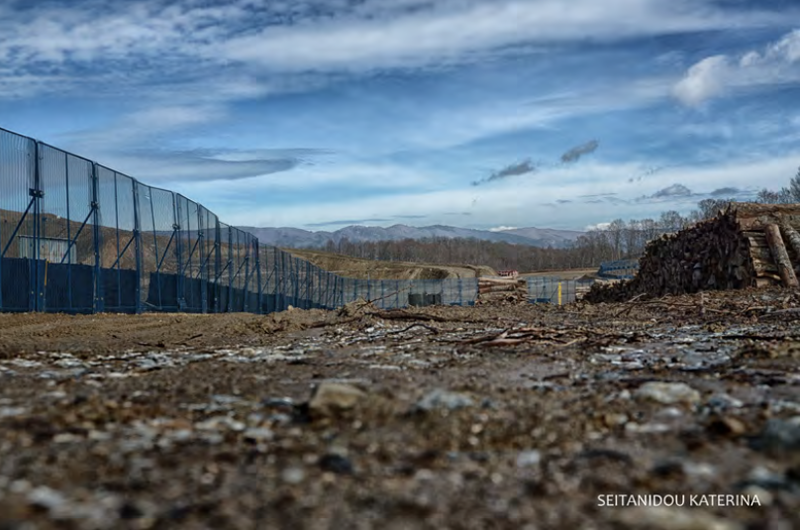 There’s no mention οf what will happen if acceptance is not achieved – but one needs look no further than the brutal repression of locals opposing the massive mining projects of Eldorado Gold in the dense forests of Halkidiki, northern Greece. Legislative changes in the direction of the RMI are already taking place, though slowly because resistances are still strong. In certain policy areas, particularly concerning investment projects, the Minerals Policy overlaps with the requirements of the memoranda imposed by the creditors. Several fast-track laws for important and strategic investments were passed in the years of the crisis but have so far failed to give results. Who benefits from the RMI? According to the Commission, the RMI is about “meeting our critical needs for growth and jobs in Europe”. But whose needs are we talking about? Whose jobs and whose growth? Metals are valuable materials. They are recovered from the ore and are then processed, manufactured, assembled and combined with other materials to make finished products. Processing and human labor add value along the way and this value is incorporated in the final product, whether it is a car, missile or medical device. Metals can be endlessly recycled and be put back into the value chain. But the primary extraction of ore per se is an industry characterized by low added value and low job creation. The EU-level statistics showing the contribution of the industrial sector in the EU economy do not tell the whole story because huge differences exist between member states. Non-ferrous metals account for 1,25% of EU manufacturing4 but this is concentrated in the industrialized countries of central and northern Europe. Behind the Commission’s sweet talk, the target of the RMI is starkly obvious. The European metals industries need metals, a lot of them and at affordable prices and they aim to get them one way or another. It will thus be the EU, as a whole, that will strive to secure supply instead of letting industries do it by themselves. It may be through resource diplomacy with non-EU metallic ore producing countries or by “removing distortive measures”- meaning twisting the arm of any country that wishes to use its mineral wealth for the benefit of its own people. Or, the EU will open the way for exploitation in European countries where mining corporations have been unable to overcome obstacles raised by law and democracy. The beneficiaries of the RMI are equally the metals industry and the mining industry who have managed to transpose their own agendas into official EU policy. In the above framework, Greece seems to be the perfect victim. A periphery country with an abundance of mineral resources, in the grip of an economic and social crisis of unimaginable proportions. With weak government and parliament that cannot even legislate without the approval of the lenders, weak institutions, corrupt political and administrative systems and the majority of population in a state of shock from the effects of neoliberal policies. Many describe it as a colony. The words “sustainable” and “sustainability” are mentioned 28 times in the 11 pages of the RMI. But sustainability of supply is not the same as sustainability of mining – and the latter is an oxymoron anyway as minerals are non-renewable resources. The Commission is trying to convince that this is something other than a colonial type resources grab. The necessity of certain metals for innovative and “clean” technologies is repeated over and over as if these were the only industries that required metals and not the super-dirty industries like the defense/war complex. Furthermore, the RMI conveniently fails to mention that solar panels and electric cars are “clean” and “green” only for the country they are used in. To the countries that supply the raw materials, mining is associated with severe environmental degradation and social impacts. Metals are cheap to the consumer only because the mining industry typically externalizes its costs. Rare earth metals, for example, are much sought after for their unique properties, but the wastes they leave behind are often radioactive. There are indications that rare earth deposits exist in Greece, including in the seabed of northern Aegean, along the coast of Macedonia and Thrace. Both the EU and the Chinese are interested in exploiting them5. Mining industry proponents in Greece try to win over public opinion by pointing to the high market prices of the metals, but only pure metals fetch these prices. Greece does not possess and is highly unlikely to obtain the technical know-how to separate rare earths and will, at best, export cheap, raw, unprocessed material (concentrates). The country’s financial gain, if any, would be minimal. On the other hand, devastating impacts to the fragile marine and coastal environment as well as damage to fisheries, tourism etc, are inevitable. Provisions existed in the 1973 Mining Code that allowed the imposition of restrictions to the export of metallic ores in order to secure supply of necessary raw materials to domestic metallurgical industries. The aim was to foster vertical exploitation of mineral wealth, but these articles were deemed incompatible with free market and were abolished in 2014. Whether imposed by the lenders or dictated by the Commission in the framework of the RMI, this move directly benefits companies that wish to profit from selling minerals in the form of concentrates rather than investing in expensive metallurgical processing and metal refining facilities. The first example that comes to mind is the Canadian Eldorado Gold. Whichever is the case, it is clear that the EU is consistent about its priorities. Corporate interests come before state interests and policies restricting access to metals will not be tolerated. The investment project of Eldorado Gold in Halkidiki is the most glaring example of what the Commission’s aims and priorities are. In 2011, Eldorado received approval to develop the gold, copper and base metals mines of Halkidiki that include the world-class Skouries and Olympias deposits. More than a decade earlier local residents had successfully fought off another Canadian company, TVX Gold, but peace did not last long. For the past few years, the area has been turned into a battle zone as the police violently suppressed demonstrations against the investment by locals who feared the effects of such a large-scale toxic industrial operation. 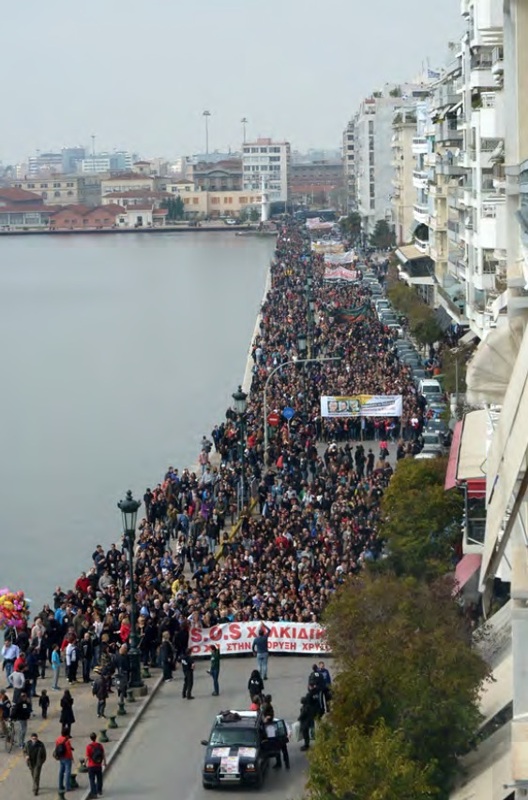 Eldorado’s projects have faced many setbacks and challenges, particularly since 2015, when SYRIZA, a leftist party that had supported the anti-mining movement came to power, Although not directly related with the memoranda imposed to Greece by its creditors, the issue of Eldorado was reportedly often brought up in meetings with the government. SYRIZA’s attitude towards the project seems to have shifted since the third memorandum was signed in July 2015 – and rumor has it that an unspoken term of the deal was allowing Eldorado’s projects to go forward. Under its contract with the state, Eldorado’s subsidiary Hellas Gold has the obligation to establish a vertical metals industry that will include the production of pure metals, gold, copper and silver. The export of high added value products which would bring tax revenues to the state was the reason the projects were approved in the first place. The company’s plan that was environmentally permitted in 2011 included a novel variation of flash smelting, a metallurgical processing technology provided by the Finnish company Outotec. But in 2016 it was finally proven that this particular processing method was unsuitable for the extremely high-arsenic ores of Halkidiki and the metallurgy study was returned to the company. This meant that the most basic contractual term could not be met and Eldorado found itself in a legal dead-end. On November 3, 2016, the very next day after signing the return of the metallurgy study to Eldorado, the Environment minister was replaced with a more pro-industry member of the government. The company was notified by the new minister that all differences over contractual obligations would be settled before an arbitration court. After trying for a year to get permits, for everything except the metallurgy unit, Eldorado resorted to frontal confrontation. On Sept 11, 2017, the government was presented with an ultimatum. 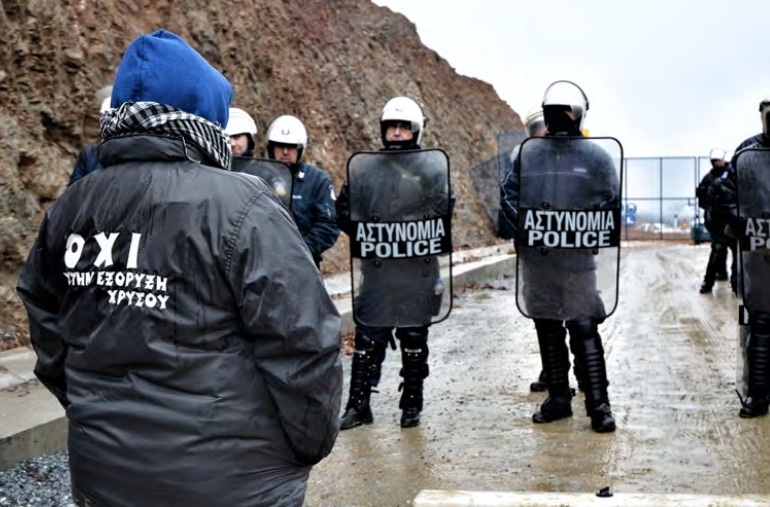 If all pending permits for Skouries and Olympias were not issued within ten days, all mines would be shut down and workers fired. EU sources said that an exit of foreign companies from Greece would complicate efforts to restore the country’s credibility6. They also said it was almost certain that Euro zone and Commission officials wouldbroach the matter with the Greek government. Another unnamed EU source told Bloomberg that the issue would be discussed at the upcoming Eurogroup meeting, in Tallinn, Estonia7. It wasn’t, but the threat worked anyway. The government quickly issued four permits for the Olympias mine which led Eldorado to back down on its threat. It is worth noting that the EU threw its weight behind Eldorado Gold without examining the validity of its claims. In the view of the EU, Greece needs foreign investment, no matter if it is environmentally and socially destructive, no matter if the company is in violation of its contract. Greece must send the message that it is open for business, any kind of business. Nor does it matter to the EU if Greece has a metallurgical processing industry and if pure metals are produced in the country or not. Apparently it is also irrelevant whether Eldorado pays taxes or not. In fact, the very same EU that is pressuring Greece in favor of Eldorado is actively helping Eldorado avoid taxes through mailbox subsidiaries in the Netherlands8. But Greece is also one of the most promising future sources of metals for the European industries and the EU cannot allow Eldorado’s projects to fail. 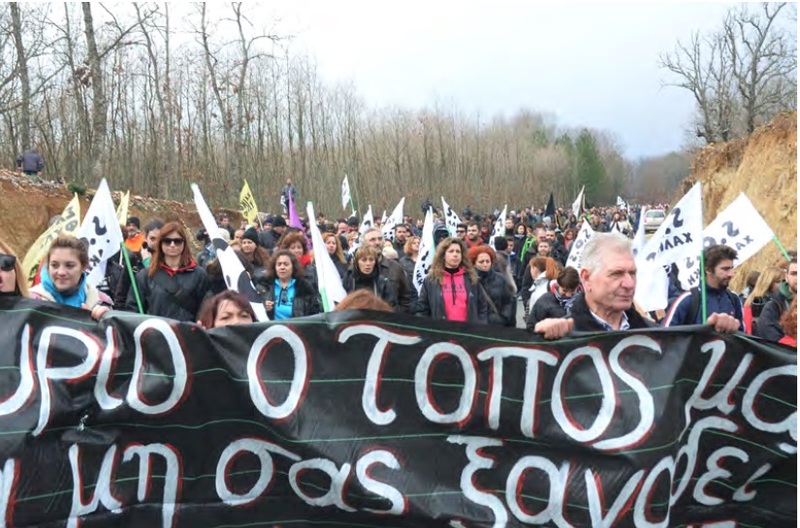 Skouries is not only a valuable deposit in itself, it is also the key to opening up new metals reserves in the north of the country where local resistance is also strong. All projects and exploration attempts are currently on hold and will not proceed until or unless the Eldorado saga is over and its mines start producing. Thus, with the help of the EU, Greece is in the process of becoming an extractivist state, much like many Latin American and African countries. A State whose sole function will be to provide the global economy with cheap raw materials, often at the cost of its own people, its own environment and its own development9. A case of colonialism, a resource curse. Democracy, human rights and the integrity of state institutions are being eroded along the way.